This is the seventh edition of the guidebook, and this time all profits will go to rebolting routes in Railay and Tonsai- See our rebolting pages for more details. King Climbers route guide book is the most up to date and comprehensive guide book on rock climbing in Thailand. It includes Railay, Krabi and Phi Phi areas. Plus pretty colour pictures, useful top tips on surviving Thailand, and miscellaneous trivia. With over 1000 routes it'll keep you busy for years. If you wish to purchase the book directly the cost is 1,050 Baht. This includes the book and airmail postage any where in the world. For each extra book you would like sent to the same address there is an extra 600 Baht charge. If you would like a copy of the book, email the number of books you would like and your postal address to kingclimbers@iname.com. King will then email you back a link to our online secure payment system. Once payment has been made the order will take 14 days to deliver. All of this year new routes, areas and information. •	Maps and Topos of Pra-Nang Beach, Rai Lay Beach, Ton Sai Beach, Chong Plee, Phi Phi Island, Phang-Nga Bay, Ko Yao Noi And Trang, Province, including Laoliang Island. •	Over 1,000 sport routes across 80 areas, Rebolted with titanium over 450	routes. • Island climbing and deep water soloing around Krabi. 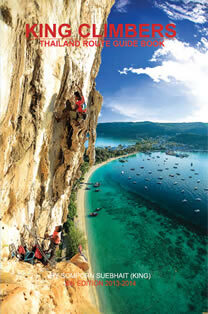 •	Other climbing destinations such as Central and Northern Thailand, Laos, Cambodia and Malaysia. •	Useful travel and local information. • All profits from the book go towards the rebolting fund. Location: Ton Sai Andaman Beach. shade all year in the afternoon. Bolts Status: Rebolted with titanium and stainless steel glue-in bolts. Wall, follow the obvious trail around hugging the base of the cliff. This goes around then up then around eventually going through an open cave (the smoking room). Go through the cave and you have arrived. Access pitch to routes 1, & 4. First two bolts same as route 4, traverse left. Belay anchor 1 bolt, 1 sling. Can avoid shity first pitch with a 2 bolt traverse from the 8th bolt of route 2. To lower off: 60 metre rope = 1 rappel, 50 metre rope = 2 rappels. Ground to anchor=30m, if using 50m rope, use sling on 4th bolt & abseil to ground. Yes there is a climbing god, and this route proves it! "Only a few years ago any mention of rockclimbing in Thailand would have conjured up images of dense jungle, leeches, mosquitos and Apocalypse Now. Nothing could be further from the truth. After a flurry of worldwide attention Phra Nang has become one of the worlds major climbing destinations and with good reason. Where else can you lower off a perfect limestone cliff to warm sands, cold beers, swaying palms and a turquoise sea? If climbers go to heaven I hope it looks like Thailand. In the past the local climbers have produced a series of basic photocopied guides, a publishing technique which was the only way to keep up with the rapid pace of development. Now that many of the classics have been established for a few years it is timely that a more substantial work be published. Climbing Thailand Route Guide Book is glossy, well presented and filled with handy hints for visitors including details on how to get there, the best times to visit, and where to find the best accommodation. There is even a useful listing of Thai words and places to go on your days off. Just over 400 sport climbs are listed on Phra Nang, it's nearby Islands, and Pee Pee. The routes are graded using the French system, which doesn't take long to get used to. Those who manage to lose their way on bolt ladders will welcome the numerous topos and the final eight pages are devoted to colour photographs which will really have you drooling. Overall, Climbing Thailand is a must for those contemplating a visit to what is touted as the best climbing area in Asia. Pack your rope, quick-draws and duty free gin." "Everyone who guides here seems to have written his or her own guidebook. Climbing Thailand Route Guide Book, however, is a very usable professional edition far exceeding those previous efforts, some seemingly scribbled on the back of Singha beer lables by the light of mosquito coils. Despite its name, Climbing Thailand Route Guide Book covers just the tiny but magical climbing meccas of Phra Nang Bay, and Pee Pee Islands. With over 400 routes ranging from 5.9 to 5.13d, featured in this guide, you'll have enough to fill idyllic weeks. King (Somporn Suebhait's nickname) also provides topos, with crags in gray-scale and routes overlaid in black. Something utterly incomprehensible in German. I'm not going to type it in, but it's in the July/August 4/97 issue, along with a whole article on climbing in Thailand so you can look it up yourself!